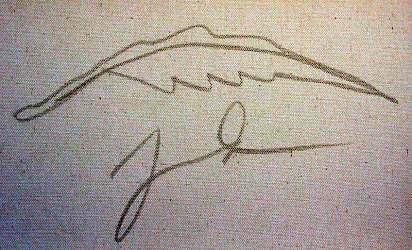 Images shown are for illustration purposes only. Yours will be the artwork as described below. This edition is limited to only 175 in the world! this artwork is DOUBLE SIGNED! 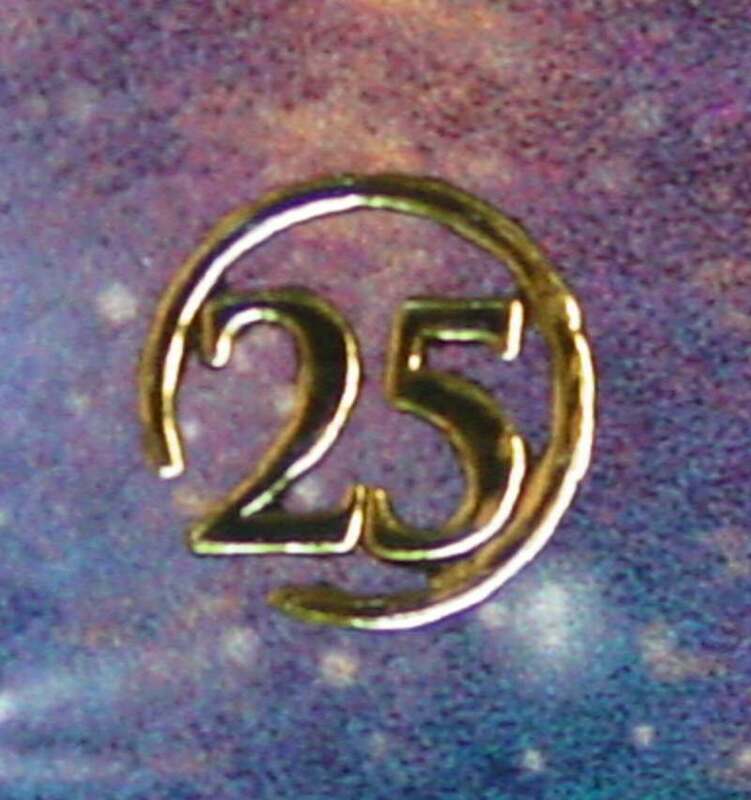 Thom has placed a total of 25 N�s in Tinker Bell and Peter Pan Fly to Neverland as tribute to his love for his wife Nanette, as well as in celebration for his 25 years as a published artist. The clock tells the time of 8:02 � in the movie when Peter and the Darlings land on Big Ben, it is 8:04 � but Thom took artistic liberty and changed it in celebration of the year he and Nanette married: 1982. 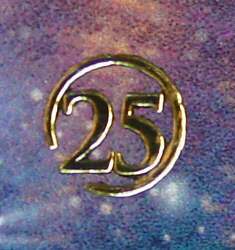 Thom has incorporated many hidden Mickeys in Tinker Bell and Peter Pan Fly to Neverland, including a Mickey balloon seller in the city. Can you find them all? Take a look at the upper left of Tinker Bell and Peter Pan Fly to Neverland and you will see Neverland, complete with an Indian encampment, Captain Hook�s pirate ship, the Mermaid lagoon and more! Thom has created another Disney Dreams Collection narrative panorama � going beyond a single scene and telling the whole story through his inspiration from the original Disney sketches that the 1953 movie was based on. The sailboat on the horizon is a tribute to Walt Disney himself. Walt loved being on boats � and Thom imagines that Walt is on this ship, sailing off on new adventures beyond Neverland! 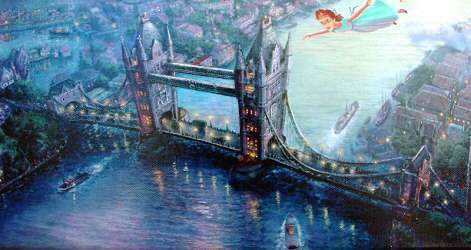 Remember in the story that as the children return to London they look back to find the sailing ship �disappearing� in the clouds? What and who else are hiding in the clouds in Tinker Bell and Peter Pan Fly to Neverland? Can you find Captain Hook, Smee, and the Lost Boys? Do you hear the Crocodile ticking? There�s also a tribute to the two previous Disney Dreams Collection �stars�! Can you find Snow White and Pinocchio? 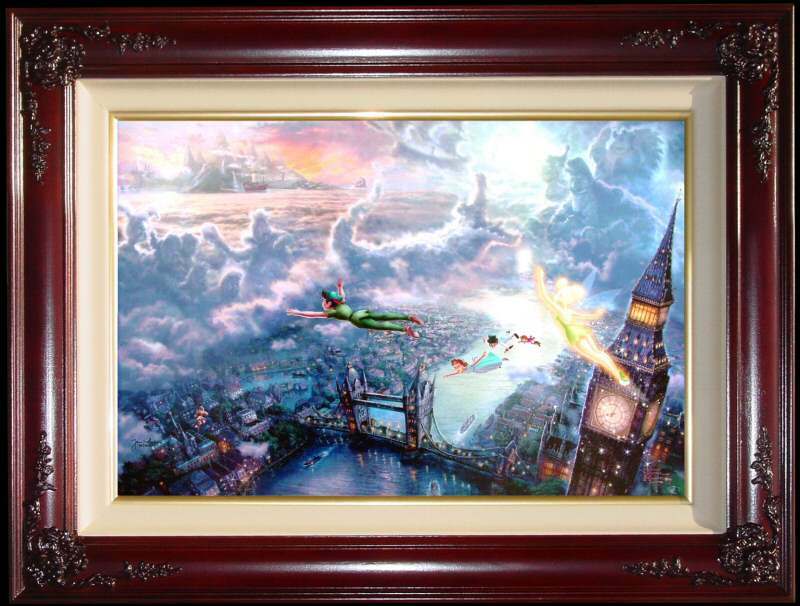 Tinker Bell and Peter Pan Fly to Neverland is the third painting in Thomas Kinkade's new Disney series entitled Disney Dreams. ++++ Rare! This Edition is Limited to only 175 in the world! ++++ Brass Plaque with the legend "Tinker Bell and Peter Pan Fly to Neverland ~~Thomas Kinkade"
"As the third piece in my Disney Dreams Collection, Tinker Bell and Peter Pan Fly to Neverland promises to be my most exciting work yet! The Peter Pan story presents the wondrous fantasies of youth: secret island hideaways, visions of mermaids and pirates, and the irresistible urge to fly high above the world. I am powerfully aware of the tug of youthful dreams � might even say that as an artist I strive to stay constantly connected with the wide-eyed wonder of childhood. As with the first two paintings in my twelve piece Disney Dreams Collection (affectionately referred to as the �Disney dozen� by diehard collectors! ), I try to tell the whole story in a single image � what I refer to as a �narrative panorama�. 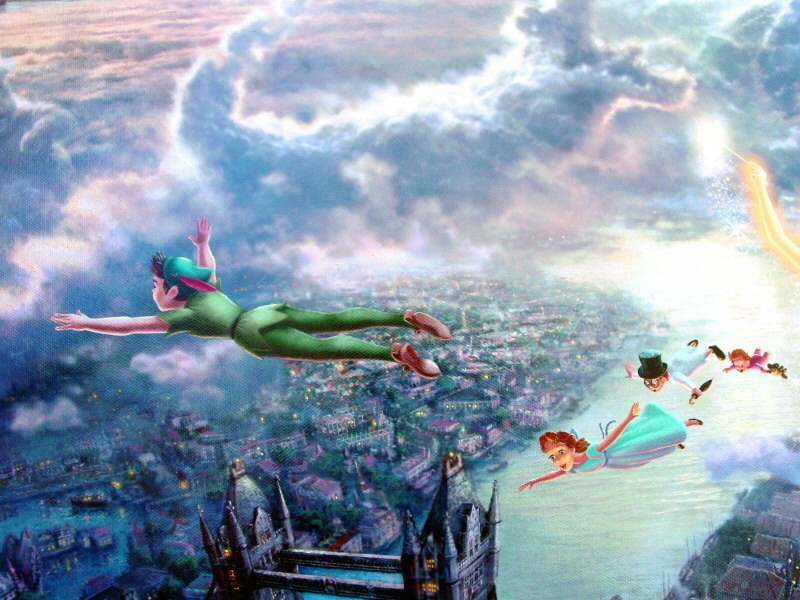 We see Neverland in the distance, just below the �second star to the right�, an enchanting land rising above the clouds. As the moon bathes the scene with its silvery light, the clouds take shape, if only in our imagination, as characters from the adventure � Captain Hook, Smee, the Lost Boys and the ubiquitous ticking crocodile. Below us we see London, its lights twinkling with a radiant glow, as the eternal waters of the Thames flow off to distant horizons.